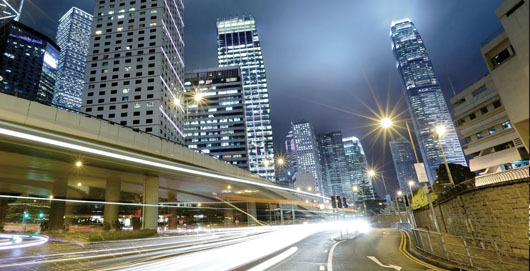 Election Coverage and Insights from Cozen O'Connor Public Strategies - Election Day is Almost Here! 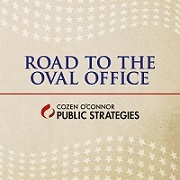 With the 2016 general election quickly approaching, Cozen O'Connor Public Strategies (CPS) professionals are remaining on the frontlines of the ever-changing developments, bringing their unique understanding of politics inside and outside the beltway to this often unpredictable election cycle. Blake Rutherford discusses recent campaign developments Fox Business News' "Making Money with Charles Payne"
In addition to a variety of media appearances on Fox Business News, CNN, Politico, Forbes, and NBC10's Political Punchouts, CPS has also launched a new podcast, Road to the Oval Office, which brings you timely and fresh analysis from both sides of the aisle. In lively conversations moderated by Blake Rutherford, a member of Hillary for America Pennsylvania Finance Council, Democratic Strategist Mark Alderman and former Treasury Department senior official Howard Schweitzer dissect the race, the candidates, and controversies surrounding both campaigns. For new and past episodes, subscribe on iTunes® or SoundCloud®. The discussions can also be heard live from 12 p.m. to 1 p.m. ET on the below dates by calling into 1-800-769-9015. Where do the candidates stand before the first debate? Live update from developments unfolding in Cleveland. Preview of the upcoming Republican and Democratic conventions. Cozen O’Connor Public Strategies professionals played a significant and active role at both the Republican and Democratic National Conventions, attending the conventions, appearing on local and national media, hosting events, and providing commentary on the activity that unfolded in Philadelphia and Cleveland. To see our coverage and impressions from the RNC, view our "Political Punchout" appearances with NBC10, OZY Facebook LIVE, Haus Rules and The Jim Bohannon Show. 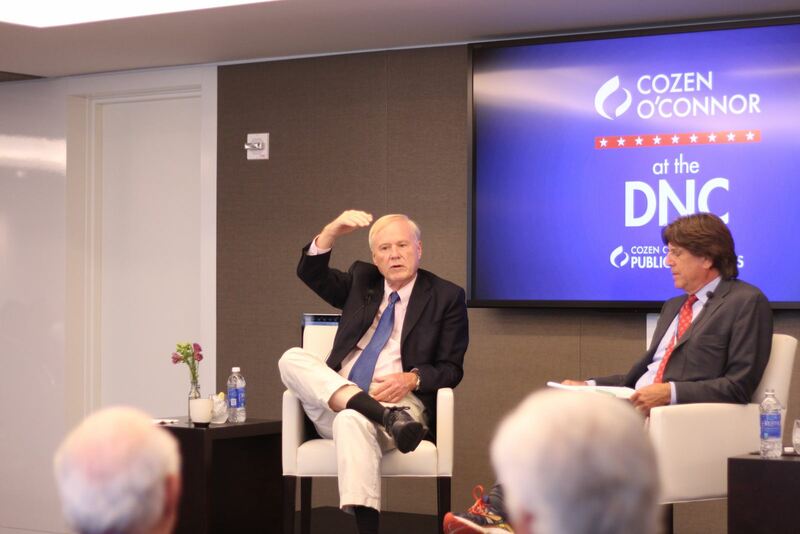 At the DNC, in addition to holding several high-profile events, including our lunch series (pictured below), at our One Liberty Place office, our professionals attended many of the exclusive convention and host committee events, and offered their seasoned insight to various media networks. This included appearances and mentions on Fox Business News, OZY on Facebook LIVE, Newsmax Prime, various top radio shows around the country as well as in USA Today and CNN.com. Mark and Republican strategist Jim Schultz also participating in nightly special called "Political Punchout" with NBC10 Philadelphia, live from the Wells Fargo Center, recapping the day’s events and adding their analysis and commentary in politically charged discussions. Blake also served as an elected delegate for Pennsylvania's 1st Congressional District. Chris Matthews from MSNBC's "Hardball with Chris Matthews"
Mark Alderman published an Op-Ed in The Daily Beast, "Confessions of an Elector: Only 270 Voters Really Get To Decide Who Our Next President Will Be." Howard Schweitzer, managing partner of Cozen O’Connor Public Strategies, published an op-ed in Forbes, “Donald Trump's Deal Of A Lifetime,” about the relationship between business and government. Mark Alderman, Blake Rutherford, Howard Schweitzer, Jim Schultz analyzed the candidates' performance and impact on the remaining 29 critical days of the race. Mark Alderman, Blake Rutherford and Howard Schweitzer discussed the VP debate and state of the race with a little more than one month left in this election season. Following the first debate, Mark Alderman, Howard Schweitzer and Blake Rutherford analyzed the candidates' performance and discussed next steps on the campaign trail. Mark Alderman, Howard Schweitzer and Blake Rutherford discussed the current status of both campaigns and previewed the first presidential debate. 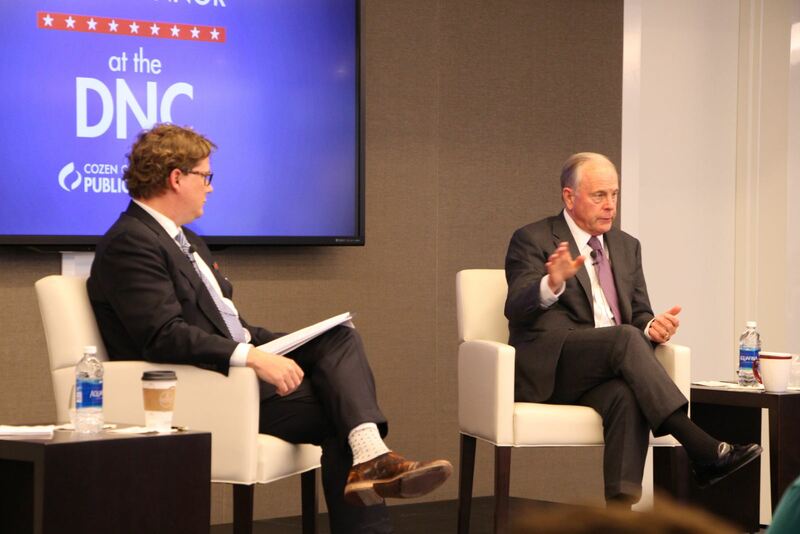 With the 2016 presidential election only two months away, Mark Alderman, Blake Rutherford and Howard Schweitzer discussed the effects of the summer's developments on both campaigns. Howard Schweitzer writes about how Donald Trump may actually feel about the duties and restrictions of being POTUS. Live from Philadelphia, Mark Alderman, Blake Rutherford and Howard Schweitzer recap President Obama's speech and discuss Hillary Clinton's speech on the last evening of the DNC (July 28). Live from Philadelphia, Mark Alderman, Blake Rutherford and Howard Schweitzer discuss Bernie Sanders' official endorsement and President Clinton's speech from the previous evening. They also preview day three of the DNC (July 27). Live from Philadelphia, Mark Alderman, Blake Rutherford and Howard Schweitzer recap Michelle Obama's speech and provide an update on developments they foresee unfolding on day two of the Democratic National Convention (July 26). Live from Philadelphia, Mark Alderman, Blake Rutherford and Howard Schweitzer recap the RNC and provide an update on developments they foresee unfolding on day one of the Democratic National Convention (July 25). Live from Cleveland, Mark Alderman, Blake Rutherford and Jim Schultz provide an update on developments unfolding at the Republican National Convention. Mark Alderman discusses potential surprises that may emerge from the Democratic National Convention in The Hill. Mark, Howard, and Blake preview the RNC and DNC and discuss how they see the conventions unfolding. Mark, Howard, and Blake discuss the results of the California primary. Mark Alderman and Howard Schweitzer discuss Donald Trump's unpredictability as a political strategy in Fortune. Mark, Howard and Blake discuss the presumptive nomination of Donald Trump, the Veepstakes, and the impact of a prolonged primary on the Democrats. Howard Schweitzer discusses the importance of building an experienced transition team within the Trump campaign in The Daily Caller. Mark Alderman, Howard Schweitzer and Blake Rutherford discuss the Pennsylvania presidential primary results and other key state races for Senate, Attorney General and more. Mark Alderman offers three key considerations for Hillary as the Democratic National Convention approaches. Howard Schweitzer was featured on CNNI’s “CNN Today” to speak about the Trump transition and the president-elect’s latest selections for his cabinet. Blake Rutherford appeared on Fox Business News’ “Making Money with Charles Payne” to discuss Donald Trump’s recent meetings with high profile media figures. Howard Schweitzer appeared on CCTV News’ “World Insight” to discuss the transition into a Trump presidency. Blake Rutherford appeared on Fox Business News’ “After the Bell” to discuss the recent protests against President-elect Trump. Howard Schweitzer appeared on “CNN Newsroom” with Brooke Baldwin to discuss President-elect Trump’s transition into the White House, as well as his possible administration picks. Howard Schweitzer comments on the president-elect's potential national security policy and team. Howard Schweitzer discusses President-Elect Trump's transition team with Sirius XM's Arlene Bynon. Howard Schweitzer offers his reaction to the Philadelphia Business Journal about Trump's victory. While appearing on Fox Business News’ “Making Money with Charles Payne,” Blake Rutherford commented on the findings of the FBI throughout their second investigation. While appearing on Fox Business News’ “Making Money with Charles Payne,” Mark Alderman talked about Donald Trump’s chances for victory in the final days before the election. Blake Rutherford appeared on MSNBC Live with Ali Velshi to comment on the steady market decline in the days leading up to the election. Blake Rutherford appeared on Fox Business News’ “After the Bell” to speak about the standings of Donald Trump and Hillary Clinton in the days leading up to the election. Mark Alderman appeared on Fox Business News’ “Making Money with Charles Payne” to talk about the polls in the days leading up to the presidential election. Appearing on Fox Business News’ “Making Money with Charles Payne,” Blake Rutherford discussed the enthusiasm gap between the candidates. Blake Rutherford was named to the winners list in a feature by Philadelphia Magazine about which Phialdelphians would be considered "winners" depending on the outcome of the presidential election. Blake Rutherford appeared on two segments of “Making Money with Charles Payne” on Fox Business News about the Clinton emails. Mark Alderman appeared on Fox News' "Making Money with Charles Payne to discuss Donald Trump’s criticism of America’s democratic system. Blake Rutherford appeared on Fox Business News’ “After the Bell” to speak about Donald Trump’s recent criticism of the Hillary Clinton campaign. Blake Rutherford appeared on Fox Business News’ “Making Money with Charles Payne” to speak about the media coverage surrounding Hillary Clinton’s leaked emails. Blake Rutherford appeared on “Making Money with Charles Payne” on Fox Business News to discuss Obamacare and the VP candidate debate. While appearing on Fox Business News’ “After the Bell,” Blake Rutherford, a member of Cozen O’Connor’s Public Strategies, commended Hillary Clinton’s experience with government affairs. Blake Rutherford joined Fox Business News to discuss the recent hearings with FBI Director Comey on the Clinton e-mails investigation. Mark Alderman discussed the candidates' performance in the first debate on "Making Money with Charles Payne" on Fox Business News. Blake Rutherford joined "Making Money with Charles Payne" on Fox Business News to discuss the Cheryl Mills immunity deal and the imminent first debate. Pennsylvania Attorney General Bruce R. Beemer appointed Blake to serve on a volunteer basis to provide counsel to the attorney general and office staff. Blake Rutherford discusses debate strategy on Fox Business News' "After the Bell." Blake Rutherford joined Fox Business News to offer his input on the portrayal of Hillary Clinton's health issues and Obama's influence as a surrogate on the trail. Blake Rutherford was quoted in the Boston Globe in an article about Clinton campaign activity in his home state of Pennsylvania. Mark Alderman and Jim Schultz debate the week’s highlights from the topsy-turvy presidential campaign, focusing on Hillary Clinton’s “deplorables” statement. Mark Alderman appeared on Fox News’ “After the Bell” to discuss the candidates’ standings and newly emerging battleground states. Blake Rutherford appeared on Fox Business News to discuss Hillary Clinton's tarmac press conference and Trump's ability to offer substantive policy offerings. Blake Rutherford joined Fox Business News to discuss his thoughts on how Donald Trump needs to present himself at the Commander-in-Chief Forum. Blake Rutherford discusses Donald Trump's shifting views on immigration policy and his rhetoric on the key topic. Howard Schweitzer joined the Michael Smerconish Program on SiriusXM’s POTUS Channel to discuss whether Donald Trump genuinely wants to be president, and if he were to win the election, how would he really tackle the job. Howard Schweitzer appeared on CNN Newsroom with Brooke Baldwin to discuss his recently published op-ed in Politico, "7 Reasons Why Trump Would Hate Being President." Blake Rutherford joined Fox Business News to discuss Trump's ability to bridge the gap with voters through various campaign strategies. Blake Rutherford discusses Hillary Clinton tying Donald Trump to the "alt-right" movement and Trump's dramatic shift on immigration with Fox Business News. Blake Rutherford joined Fox Business News to discuss recent developments related to Trump's social media antics and Hillary Clinton's campaign approach. Blake Rutherford discusses voting trends and constituents in Pennsylvania with the Wall Street Journal. Mark Alderman discusses the contrasting portrayals of the United States depicted by the Republicans and Democrats during their respective conventions with US News. Jim Schultz and Mark Alderman discuss what Hilary needs to accomplish in her acceptance speech during the DNC. Mark Alderman, chairman of Cozen O'Connor Public Strategies, and Jim Schultz, chair of Cozen O'Connor's Government Law & Regulatory practice discuss day one of the DNC. Mark Alderman, chairman of Cozen O'Connor Public Strategies, discusses the first day of the DNC on Newsmax Prime. Blake Rutherford, a member of Cozen O'Connor's Public Strategies group, discusses the Democratic National Convention on McClatchy DC. Blake Rutherford discusses Trump's economic agenda and Clinton's plan to acknowledge Obama but differentiate herself as a new leader with CNBC's Closing Bell. Mark Alderman, chair of Cozen O'Connor's Public Strategies, discusses Donald Trump's America on CNN Politics. Mark Alderman, chairman of Cozen O'Connor Public Strategies, and Jim Schultz, chair of the Government Law and Regulatory Affairs, discuss the Republican National Convention on NBC10. Jim Schultz discusses Ted Cruz’s decision not to endorse Donald Trump at the Republican National Convention on NBC10 News. Mark Alderman and Jim Schultz discuss Melania's speech at the Republican National Convention on NBC10 News. Howard Schweitzer discusses his impressions in Cleveland on day two of the convention and discusses Trump's candidacy with Haus Rules radio show. Howard Schweitzer and Mark Alderman share their perspective on the Republican convention and comment on the candidates' strategies. Howard Schweitzer discusses the inclusion of the historically anti-Wall Street 1933 Glass-Steagall Act in the GOP platform with the Washington Post. 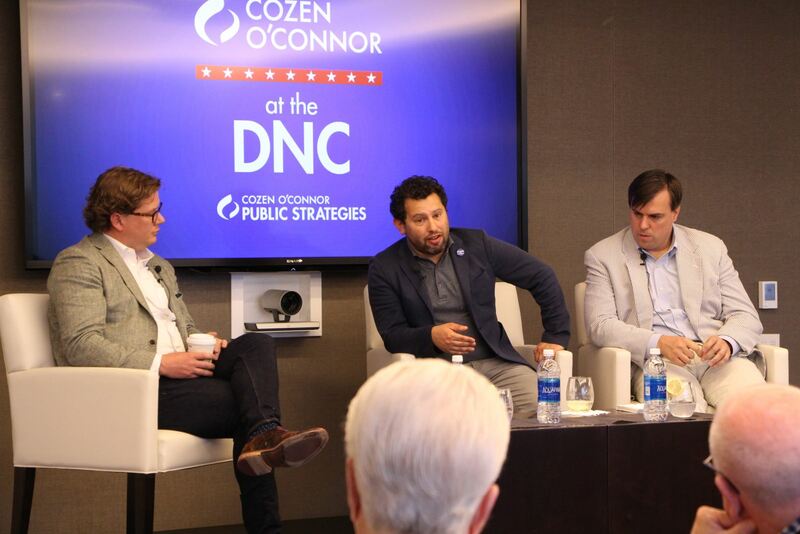 In addition to the reception in the Philadelphia, Cozen O’Connor Public Strategies will host a series of lunch time “fire-side” chats with political insiders during the DNC. Mark Alderman discusses Bernie Sanders' influence on the Democratic Party and how the open carry rule may play out in Cleveland. Who is the Front Runner for Trump's VP? Jim Schultz, chair of Cozen O’Connor’s Government Law and Regulatory Affairs practice group, discusses who Trump's VP picks could be on NBC10. Mark Alderman discusses Bernie Sanders endorsement of Hillary Clinton, the ensuing opportunities, and the dynamic of the Democratic convention on Sirius XM's POTUS Politics. Mark Alderman discussed President Obama’s response to the tragedy in Dallas and then reacts to Bernie Sanders’ endorsement of Hilary Clinton on the Fox Business Network. Mark Alderman and Jim Schultz have the latest on the race for president, including Trump's plan to announce a possible running mate. Mark Alderman and Jim Schultz discuss Brexit and two controversies surrounding Hilary Clinton on NBC10 news. Will Firing His Campaign Manager Help or Hurt the Trump Campaign? Mark Alderman and Jim Schultz discuss presidential polling and a change up in the Trump campaign on NBC10 news. Mark Alderman and Jim Schultz appear on NBC10 news to discuss the tragedy in Orlando and its impact on the 2016 presidential election. Mark Alderman and Jim Schultz evaluate the 2016 Democratic and Republican presidential nominees on NBC10 news. Mark Alderman discusses the Sanders campaign's future and persistence on After the Bell. Mark Alderman discusses Clinton's media woes in a U.S. News & World Report article titled, "Clinton Can't Win for Losing." Howard Schweitzer discusses the most recent U.S. State Department report about Hillary Clinton’s emails on POTUS Politics radio show. Blake Rutherford's election as a delegate for Pennsylvania’s 1st Congressional District during the Democratic National Convention in Philadelphia is featured in various media. Mark Alderman, chairman of Cozen O'Connor Public Strategies, discusses the upcoming California primary on CNBC. Howard Schweitzer, managing partner of Cozen O’Connor Public Strategies, discusses the latest developments regarding Hillary’s emails. Mark Alderman, chairman of Cozen O’Connor Public Strategies, discusses allegations against Virginia Governor Terry McAuliffe on One American News Network. Mark Alderman, chairman of Cozen O'Connor Public Strategies, says Trump is an advantage for Democrats. Mark Alderman tells the Boston Herald that the protracted Sanders campaign is taking a toll on the Democratic party. Mark Alderman discusses the ticking clock for the Sanders campaign in U.S. News & World Report. Mark Alderman discusses the uncivil war erupting within the Democratic Party's ranks in the Charlotte Observer and Pittsburgh Post-Gazette. Howard Schweitzer discusses the latest ruling on Obamacare and The Washington Post's research on Donald Trump on Newsmax Prime. Mark Alderman discusses the political responses to Donald Trump as the presumptive Republican presidential nominee on Newsmax Prime. Howard Schweitzer discusses the Republican presidential primary race in Indiana on the Fort Wayne Morning News radio program. Mark Alderman discusses the results of the New York primary on After the Bell. Mark Alderman discusses the New York democratic primary race on Fox Business Network's After the Bell. Mark Alderman discusses the unlikeliness of Speaker Paul Ryan joining the Republican presidential nomination contest. Mark Alderman, chairman of Cozen O'Connor's Public Strategies, discusses the Democratic primary in Wisconsin on Fox News. Mark Alderman discusses the way voters are reacting to the various presidential primary campaigns on Newsmax Prime. Mark Alderman, chairman of Cozen O'Connor Public Strategies, discusses the presidential election on Fox Business. Mark Alderman discusses the Republican and Democratic presidential primary races on Newsmax Prime.